It’s one of the hardest things to navigate as a reading teacher. 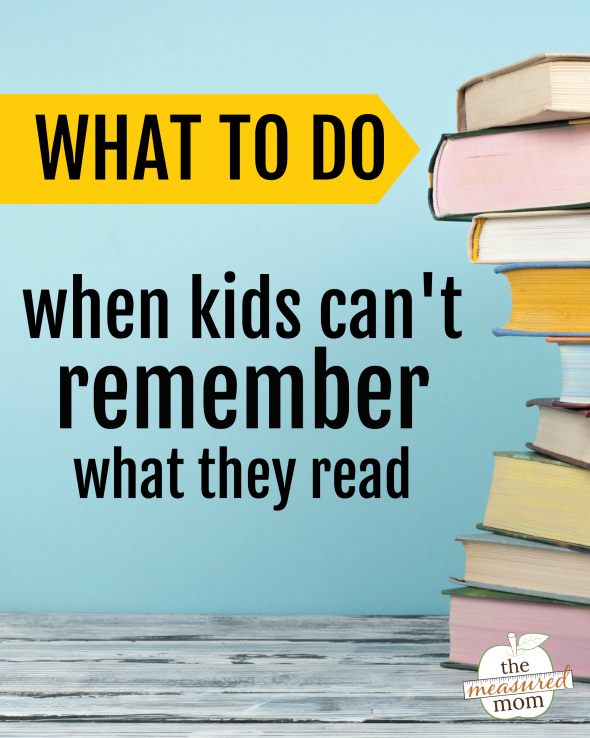 What do you do when kids can’t remember what they read? Especially if they’re reading a book you’re not familiar with? It’s one of my least favorite experiences as a classroom teacher … trying to get answers from a student about the chapter book s/he read – only to get blank stares or a terribly confusing summary. Occasionally I experience the same thing at home. My Seven sounds like a great reader – but I often find that he’s just word calling. He’s reading so he can be done … not so he can enjoy the text. What’s a teacher or parent to do when kids can’t remember what they read? 1- Know what to listen for. One of the hardest things to do is assess comprehension when a learner is reading a chapter book or nonfiction book you’ve never read. 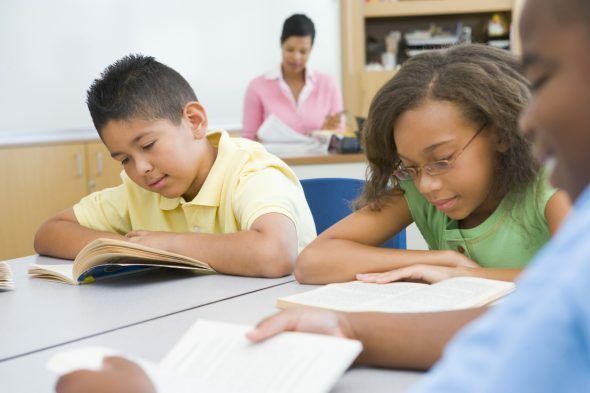 How can you learn – in just a short conversation – whether or not the student understands what s/he read? Quickly scan the book yourself, first. It’s amazing what you can pick up from the back cover, front flap, and chapter titles. Listen to how the reader summarizes the book or chapter. If h/she is giving you every single detail, that’s not a great sign. Does the learner know how to pick out and report only what’s most important? Observe – does the reader rely on your prompting to summarize the text? Some prompting is normal, but you shouldn’t feel like you’re pulling teeth to get a single sentence out of the reader. Notice how the reader feels. If h/she looks trapped, comprehension may be poor. 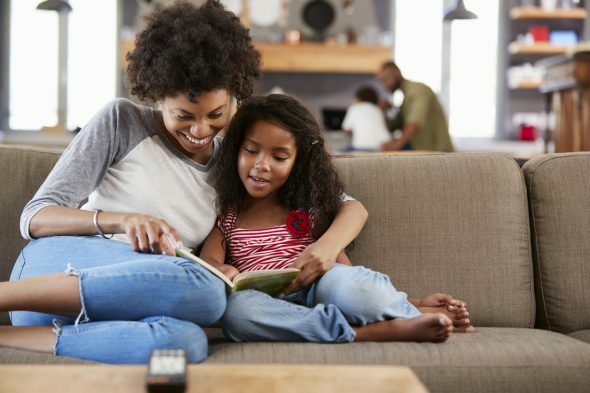 If h/she is eager to tell about the story, laughs about the funny parts, and spontaneously connects his/her life to the book, these are all signs that comprehension is good. 2 – Make sure the book is appropriate. 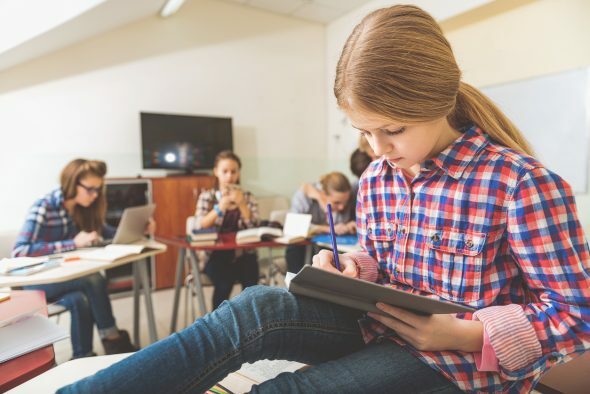 While we don’t want to trade books every time there’s a comprehension issue, it’s important to make sure the book is at the learner’s reading level and has appropriate content. Content is just as important. A strong reader in second grade may not be ready for historical fiction about World War II – even if it’s a low-level chapter book. 3 – Teach them to preview the text before reading. I don’t know about you, but I almost never pick up a book and immediately start reading. I look at the cover, I read the front flap, and I check out the back summary. I might even look up reviews before I dive into the book. Train your readers not to start a book “cold.” Show them how to read the back and/or the table of contents before getting started. They can even page through the whole thing, looking at the pictures (if there are any). 4 – Teach them to monitor their comprehension. This is hard, but it’s important. Teach your learners to pause periodically and think about what they just read. You can model this doing a think aloud. Show them exactly how to do it. If they get to a stopping point – and can’t remember what they read – they need to go back and reread. If it’s still confusing, they need to ask for help. 5 – Teach fix-up strategies. Figure out the meaning of a tough word (whether that means checking a dictionary, using context clues, or asking someone else). Read the confusing part more slowly. See if text features (such as pictures and captions) can help clear things up. Create a picture in their mind as they read – or sketch it on paper. 6 – Give a purpose for reading. Read this chapter, and tell me the most important thing that happened. Read these two pages, and tell me the most important thing the author wants you to remember. Read these three pages, and tell me the problem the main character is having. Read this page, and tell me a question you still have about the topic. You get the idea. This moves naturally into #7. 7 – Use a paper clip. This goes back to #6. Put a paper clip where you want your learner to stop and engage with the text. This may mean talking or thinking to him/herself, or using sticky notes to respond to the text (see #8). If you’re in a setting where this works (such as at home at the kitchen table), have your learner come to you and talk about what s/he read when s/he gets to the paper clip (see #6). 8 – Use sticky notes. Sticky notes are seriously unappreciated! It’s truly amazing how many possibilities they hold for our young readers. What are some things your learner could write on sticky notes? I think ______ will happen next. The most important thing in this chapter was _______. A question I have is _________. 9 – Talk through a graphic organizer. If a learner is struggling to talk to you about a text, it can be helpful to have a visual organizer. I plan to create some of these for my blog, but for now you can search on Pinterest for “free graphic organizer.” If your learner is reading a fiction book, find one that has him/her name the characters, setting, and plot. If your learner is reading nonfiction, find an organizer that helps him/her sort through and identify the most important information. While it’s great to have learners respond in writing, I recommend holding off on that if your learner is really struggling to comprehend. Just talk through the graphic organizer for now. One beast at a time. 10 – Think conversation, not quiz. This is so hard to do, and I fail at it at least half the time, but it’s important to remember. Try not to quiz your readers. That’s not fun for anyone! If you feel yourself throwing out question after question, rather than engaging in conversation about the book, slow down. Imagine that you and the reader are in a mini-book club. Your learners are much more likely to enjoy reading if they know they get to talk with you about it afterward – not get tested. Do you have any more tips for helping kids who struggle to comprehend? We’d love to hear them in the comments! © 2018, Anna G. All rights reserved. I enjoy your reading and writing resources the most. Thank you! I have a student who reads fluently but doesn’t remember anything read. I have her stop after each paragraph and tell me at least the “who” and the “what.” If I’m busy I have her talk into voice memo. I love your website,and the resources are absolutely wonderful the kids enjoy doing the worksheets and activities you provide. Thank you for providing your time and resources for us. I love your website and the resources that you have to offer! I love your resources and all the great information you share! Thank you, Donna – I appreciate the encouragement! What resources have I NOT USED. Thank you for creating these resources for us, so that we can best teach our kids.. Thank you, Jody – it’s truly a joy! I always look forward to your reading articles! My third graders are awesome readers but many of them struggle with comprehension. Thank you for this great resource. I have the same problem with students but we read in class paragraph by paragraph and they make comments about the paragraph and we make a summary together. I’m sorry for my english.